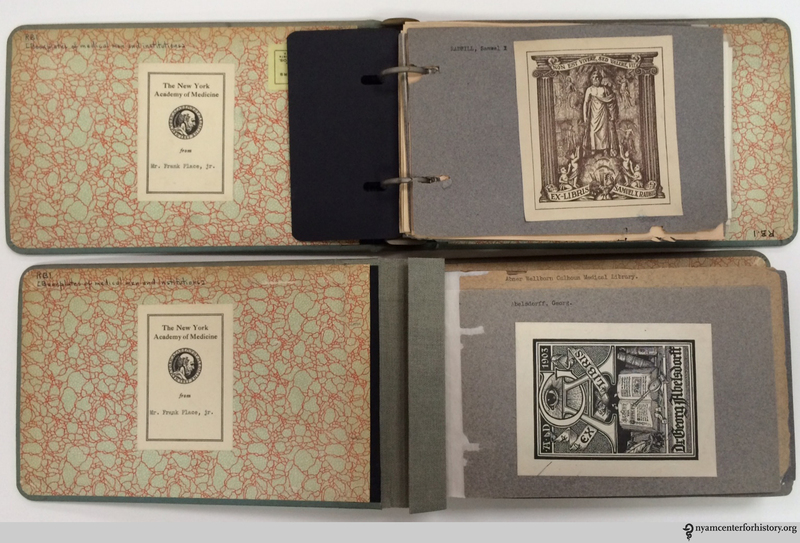 In the summer of 2014, conservators in the Gladys Brooks Book & Paper Conservation Laboratory began treating three scrapbooks containing 184 bookplates.2 Frank Place, Jr., NYAM’s reference librarian from 1905 to 1945, collected them and donated the books to the library sometime in the mid-20th century. In compiling his collection, Mr. Place mounted the bookplates onto recycled paper pamphlet covers (measuring approximately 5.25” x 8”) and stored them alphabetically in two-ring binders,3 which were actively damaging the plates’ fragile paper supports and making it difficult to use the collection. Binder showing ring mechanism and resulting damage to paper supports. 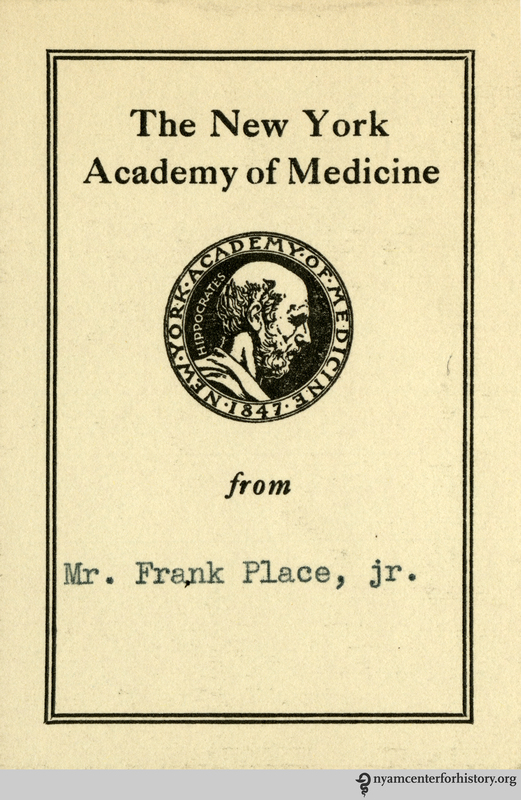 Example of pamphlet cover Mr. Place reused as a support for his bookplates. 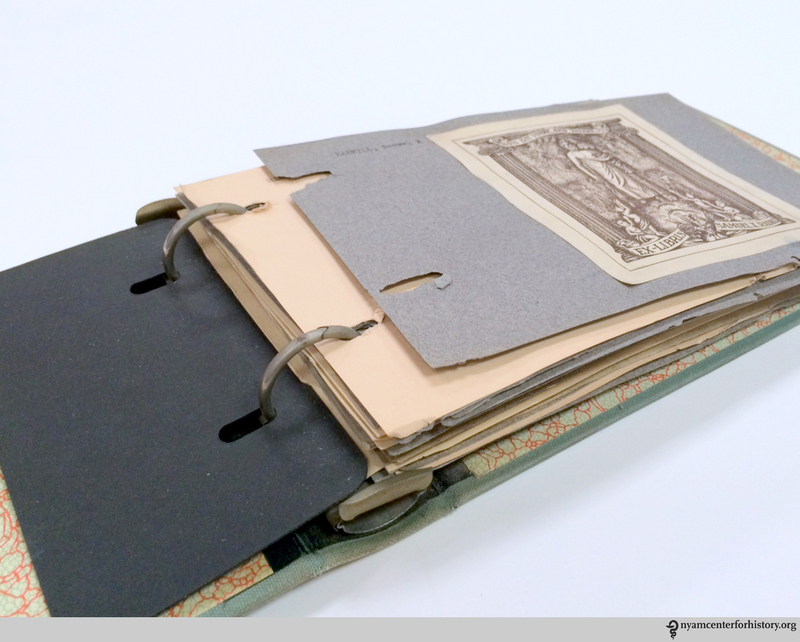 To remedy these issues and minimize the risk of future damage, conservators modified the binders while retaining as much of the original binding structure as possible, replacing the ring mechanisms with fixed posts and hinging the paper supports onto stubs. 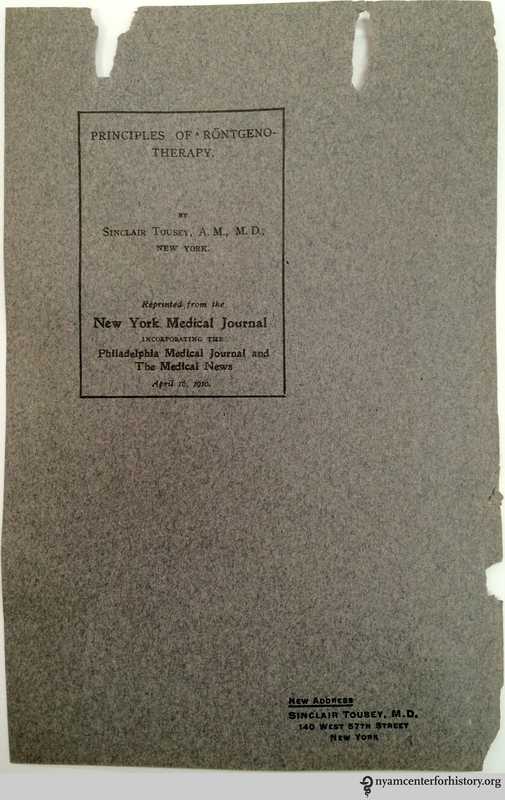 Top: Volume 3, before treatment, in its original ring binder. Bottom: Volume 1, after treatment, in a modified post binding with hinged plates. Before and after binder modification. 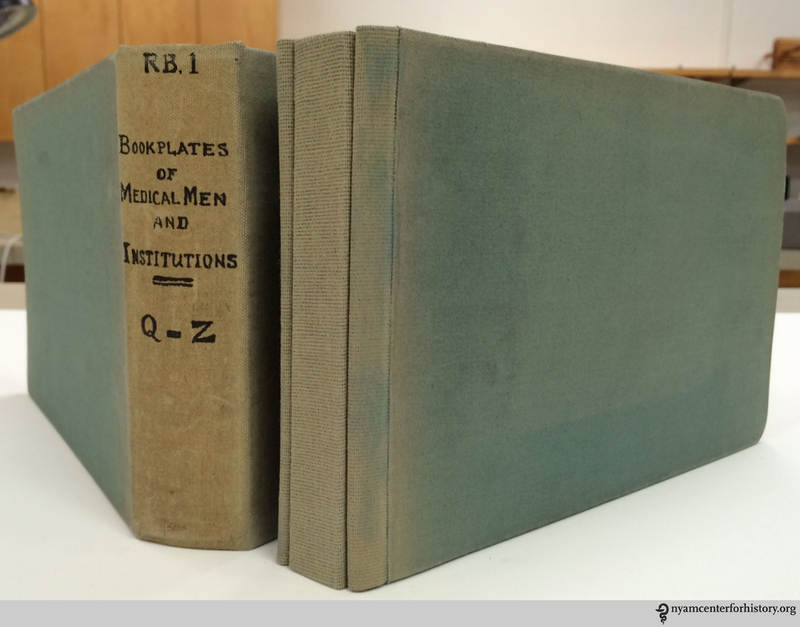 Because the original binder spine pieces were too big for the modified structures, conservators encapsulated the pieces in Mylar and affixed them to protective four-flap enclosures. Mylar-spine wrappers with encapsulated original spine pieces. Mr. Place’s charming collection in NYAM’s library offers a window into what some scholars have referred to as the “golden age of bookplate enthusiasm,”4 which spanned from the end of the 19th century through the first decades of the 20th century. During this time, societies for the collection and exchange of ex-libris sprang up across Europe and the United States. Collectors prized plates for their aesthetic value as miniature pieces of art and often acquired them, not for use in identifying their books, but for the sole purpose of organizing, exhibiting, and exchanging them with others. Many collectors limited their acquisitions to bookplates representing a particular theme and, here, it is no surprise that Mr. Place specialized in the plates of medical practitioners and institutions. Correspondence (included in the scrapbooks) between Mr. Place and other collectors (specifically H. M. Barlow, secretary at the Royal College of Physicians, and Dr. Henry de Forest, a prominent New York physician5) indicates that he was not only interested in growing NYAM’s collection but, in the spirit of the times, was also an active contributor to the collections of others. Ornamental name labels of (left) Samuel Smith Purple, MD and (right) Robert Latou Dickinson, MD. to elaborately illustrated panels, depicting anything from coats of arms to the owner’s occupation and hobbies. Not surprisingly, in the case of medical bookplates, images such as Hippocrates, microscopes, and the caduceus, along with skeletons, skulls, and beakers tend to figure prominently. It is a pity we do not know whether, in addition to collecting, Mr. Place ever commissioned his own miniature work of art to grace the inside covers of his personal volumes. Thanks to a bookplate, however, we are forever reminded of his contribution of this delightful little collection to NYAM’s library. Treatment of the third and final scrapbook is in process and the entire collection will be available for use in early 2015. In the meantime, a list of all 184 bookplates can be obtained by contacting history@nyam.org or calling 212-822-7313. 1. The oldest known American bookplate dates to 1679 and takes the form of a simple label indicating the owner’s name. Curtin, R. G. (1910). 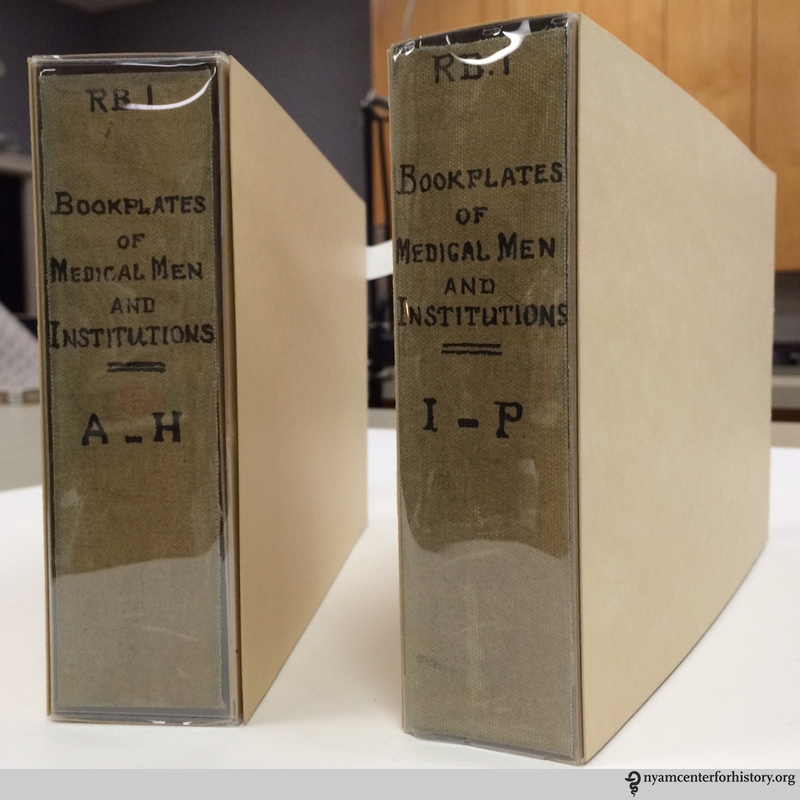 “The Book-Plates of Physicians, with Remarks on the Physician’s Leisure-Hour ‘Hobbies’.” Philadelphia: J.B. Lippincott Co. (Reprinted from International Clinics, Vol. II, 20th Series), p. 239. 2. Thanks to Saira Haqqi, 2014 Gladys Brooks Book Conservation Intern, for her work conserving volume 2 of this collection. 3. In an address to the Historical Section of the Philadelphia College of Physicians on November 22, 1907, physician and bookplate collector Roland G. Curtin advises collectors to hinge their plates onto paper cards (measuring 7.5” x 9.5”) and to keep the cards loose, thus enabling the inspection of the backside of plates as well as the display of single plates without endangering the entire collection. Ibid. 253. It seems likely that Mr. Place read Dr. Curtin’s address (a reprint, cited above, was accessioned into NYAM’s collection in 1910) and was endeavoring to follow this advice when arranging his own collection. 4. Pincott, A. “American Bookplates.” Rev. of American Bookplates by W.E. Butler. Print Quarterly, Vol. 18, No. 3 (Sept. 2001), p. 351. http://www.jstor.org/stable/41826267. 5. See blog post by Arlene Shaner, Reference Librarian for NYAM’s Historical Collections, discussing a bookplate and correspondence from Dr. Henry de Forest: https://nyamcenterforhistory.org/2013/03/06/biblioclasts-bibliosnitches-beware/. This entry was posted in Collections, Conservation and tagged book conservation, bookplates, conservation and preservation, Gladys Brooks Book & Paper Conservation Laboratory, Item of the Month by nyamhistorymed. Bookmark the permalink.